In preparation of Episode VIII, our friend Nader asked if he really needed to watch the Star Wars Prequels. The question garnered several responses; some being “Yes” and some being “No.” I made the claim that I could break down Episodes I, II, and III in 6 sentences. I figured 2 sentences per film was adequate. Atul’s brother decided to take me up on the challenge, so I took a crack at it. Honestly, because I thought I could do it. I also feel that so little happened in those films that contributed to the overall story that spending 7 to 8 hours watching the films is time wasted for me. I own the entire Blu Ray series, and have never had an urge to watch any of the prequels. Everything I’d want to rewatch from those films I’d find on YouTube. Batman has been active for a year ridding Gotham of mob related crime, so the mob turns to the Joker to “kill the Batman.” Batman, along with Harvey Dent, manages to take down the Joker and the Mob, but at the cost of Dent’s soul and Rachel’s life. Now, is that essentially the plot of the film? Yeah, sure. Yet, I feel there is a lot more in The Dark Knight that is worth watching/rewatching than just simply reading those 2 sentences. Great performances, intense action, uplifting moments, heartbreaking scenes, and compelling music. Alternatively, the Prequels don’t contain more, for me, than is in the sentences. The only things I would go back to revisit are some of the lightsaber battles, and certain themes from John Williams’ score. Cool…So Never Watch the Prequels? No. That’s not what I’m saying. I’m saying that the Star Wars Prequels don’t work for me. I personally think they’re long, uneventful, poorly acted, and lazily made for the most part. But that’s the thing, it’s my opinion. 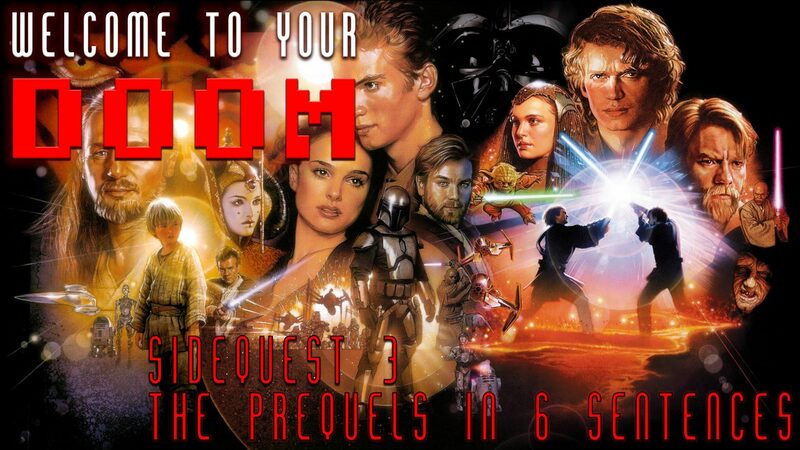 I strongly encourage folks that haven’t seen the prequels to check them out. The 6 sentences that will follow are the absolute bare bones of what happens in the films. In fact, I didn’t intend to write these sentences to talk someone out of watching the films. I actually wrote them FOR Star Wars fans. People that have already seen and have formed their own opinions on the films. The 6 sentences can also be used for those that haven’t seen the prequels and lead with the question: “Do I reallllllllllly need to watch them?” If someone leads with this question, it is typically because they feel obligated to watch the movies but don’t want to. They either don’t have the time, or have heard they’re not very good. They’re asking us, Star Wars fans, to let them off the hook by saying “no don’t worry about it, they’re bad.” I truly believe that they should watch the films to form their own opinions and experience the Prequels themselves, but going into anything with the wrong attitude isn’t going to yield successful results. As such, why should they waste their time with something they’ve ultimately already sabotaged in their mind? So, in short, the following is for those that have either seen the Prequels, or are never going to see the Prequels. If you’re on the fence, or legitimately want to watch them and haven’t, stop here. 1. The prequels introduce, or reintroduce, the characters Obiwan Kenobi, Anakin Skywalker, Princess Padame, Senator Palpatine and the Jedi Order who are basically the space cops and ambassadors of the space government. 3. The galactic trade federation are jerks being secretly led by the dark lord of the sith and are amassing power to seemingly overthrow the space government. 4. To deal with that, the Senate uses a mysterious clone army, led by Jedi, to take down those trade federation jerks and also gives Palpatine supreme powers over the space government to enact these decisions. 5. Meanwhile, Anakin befriends Palpatine, who is actually the master sith lord and is manipulating Anakin, and Skywalker also loves and marries Padme while knocking her up with twins. 6. Palpatine’s master strike is to use Anakin to eliminate all the Jedi, but Anakin fails to complete his mission, gets slice and diced by Obiwan, his wife dies giving birth to Luke and Leia, and gets put back together as Darth Vader while Palpatine assumes the role Emperor. And that’s it folks. Why am I sharing this? Mainly because it was a fun little exercise. Also, because I’ve heard people question the necessity of watching the prequels many times and now I have a fairly succinct answer and wanted to share it. I certainly don’t think it is, and don’t want to be, the answer for people to not watch the Prequels at least once. I just hope that Star Wars fans can read this and find some comedy, truth, or contrast in my views.